SDCC 2017: Seth Rogen and the Preacher cast talk AMC's hit show in Hall H – AiPT! Here’s everything we learned (and every funny thing Seth Rogen said) at the Preacher panel in Hall H at SDCC 2017. 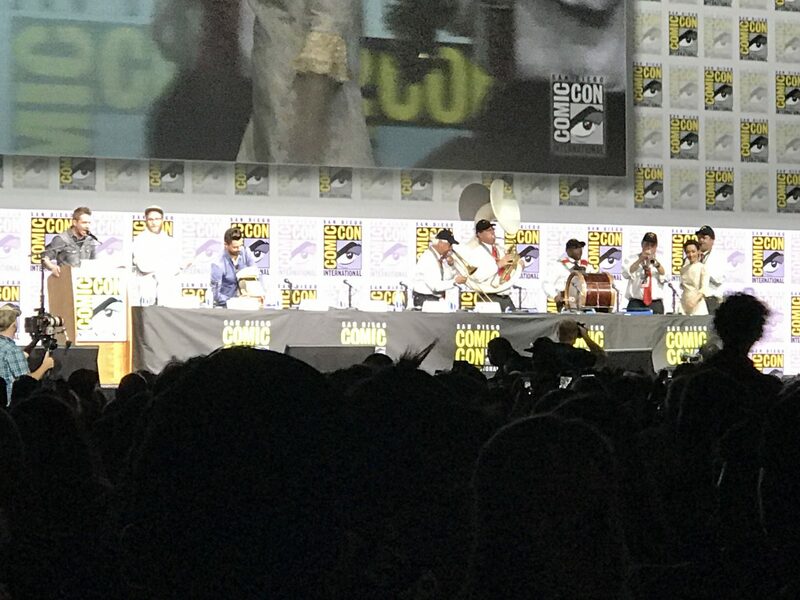 A Louisiana band and dancers opened the Preacher panel to the delight of fans. Sporting drums, saxophone, trombone and even a tuba, a chain of folks played instruments and walked on stage as the screen displayed shots from season 2. Snapshots included the entire cast with moody lighting as if in a seedy bar. Some of the photography was directly from episodes, but most were promo images. Chris Hardwick hosted the panel and kicked off by showing the trailer for season 2. Highlights of the trailer included Hitler and Arseface escaping prison, and mysterious military types talking about the Devil. Hardwick commented that the first season was more about setting up the characters and the rules of the world. Rogen made it clear why that was by saying, “If you’re someone in this room it’s not that f-----g crazy,” because most folks at San Diego Comic Con have read the comics, but if you’re someone randomly tuning in you’d be losing your s--t. “We took our time getting there, but now we’re there and it’s fun to have them all together and get into the meat of the show and the mission,” Rogen said. At one point Hardwick called Cooper out for filming on stage. 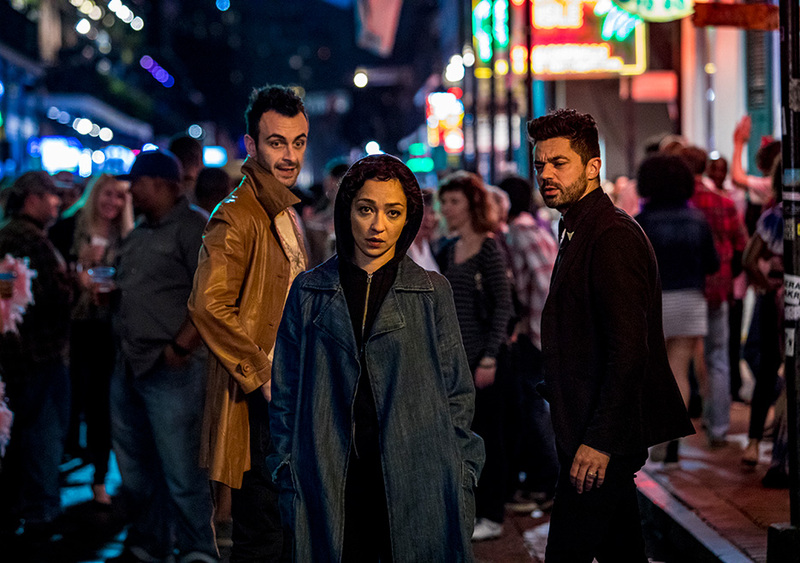 It was quite clear Joseph Gilgun was a fan favorite based on the reaction he got throughout the show (and Hardwick even gushed over his performance as Cassidy). Gilgun made it clear he thinks his character is on a path to redemption. “He needs Jesse. His behavior, especially in the comic–he’s done some really terrible things. There’s something stable for the first time in a long time,” Gilgun said. The topic of vampirism, specifically if Cassidy being a vampire would be a bigger deal in the show, came up. Rogen said it will, but not until the second half of season two. “There’s kind of a vampire thing that happens in the second half of the season. It gets more vampire-ey in the back half of the season. At the end of the day he’s a vampire, so you got to deal with that,” Rogen said with laughter from the audience. Everyone in attendance was given an Arseface mask. Graham McTavish then discussed approaching his character The Saint of Killers with some form of reality in mind. “I try to relate everything I do in some form of reality,” McTavish said, only in this case, to look at his family, he kind of has to kill Jesse. Everyone’s favorite Areface played by Ian Colletti was up next, and he spoke to how difficult it is acting with your mouth covered. “Your face is basically a tool as an actor,” Colletti said. Rogen chimed in asking, “what are you doing under there?” to much laughter from the audience. Colletti was a good enough sport to show the audience with a silly smile. To the delight of the audience, Hardwick prepared the audience for an exclusive scene (running nearly five minutes) showcasing a new character. He told the audience he was olibigated to make it clear young kids should leave due to strong language, to which Gilgun retorted, “You’re going to ruin 2017–you’re going to ruin it, sensitive people!” The audience laughed at that. After showing a clip from the a Grail recruitment program which featured actor Pip Torrens who plays Herr Star, Torrens, actress Julie Ann Emery, and actor Malcolm Barrett came out on stage. Torrens pointed out his rather evil and comically intense character was a therapeutic character to play on set. “Any bad feelings you bring to set on day one you’ll expunge them, especially with a scene like that,” Torrens said. Judging by the stuff he did in the clip, we believe him! Emery and Barrett were brief in their remarks in part because they said any details about their characters would be spoilers. Rogen replied back, “Complain a little, stop for a nosh,” which received a big laugh from the audience. SDCC 2017: Not at the con? Toys ‘R’ Us has the toy exclusives – But hurry!